WASHINGTON, DC -- With relations between Russia and the United States at a low point, it was a big delegation from Russia at the annual National Prayer Breakfast in Washington to hear President Donald Trump speak that turned heads. Ukrainian former Prime Minister Yulia Tymoshenko (C) attends the National Prayer Breakfast in Washington, D.C., on February 8. Little focus was put on another large group of attendees eager for a chance to get face time with the president and senior U.S. officials: Ukrainian lawmakers. Some lawmakers who stayed in Kiev said the absence of such a large number of their colleagues paralyzed the work of Ukraine's parliament, the Verkhovna Rada, and they lamented the fact that dozens of their colleagues chose the prayer breakfast over important debates and possible votes on crucial legislation. On February 7, parliamentary sessions were closed in advance so that deputies flying to Washington could catch their flights. The next day, parliament opened and adjourned without any votes on key legislation, and photos of the legislative hall showed dozens of empty seats. Parliament had been expected to discuss and vote on an important bill that would repeal a law passed last year requiring Ukraine's anticorruption activists and NGOs to publicly declare their income and assets in a newly created electronic system. International rights groups have warned Kiev that forcing activists and NGOs to make such declarations would hamper their work. Repealing the law is an urgent and necessary step, Human Rights Watch has said, because the deadline for activists' self-declarations is April 1. Lawmakers were also meant to debate a crucial bill that would allow for the creation of an anticorruption court to support the National Anticorruption Bureau of Ukraine (NABU) in its fight against entrenched graft. That bill has been criticized by the International Monetary Fund (IMF) and World Bank for not being in line with the recommendations of the Venice Commission, but lawmakers would have been able to suggest changes to it if they had convened. The irony of Ukrainian lawmakers wanting to go to Washington to impress supporters is that the opposite may happen: further delay of these bills is unlikely to sit well with Ukraine's Western backers, who have raised concerns in recent weeks about Kiev's perceived backsliding on reform commitments, which have held up billions of dollars in IMF loans. Serhiy Leshchenko, a lawmaker and prominent anticorruption campaigner, scolded his fellow deputies who attended the prayer breakfast for putting the chance to boost their profiles above their civic duty at a critical time for the country. "Yesterday, the day was lost," Leshchenko told RFE/RL in Kiev, referring to parliament's February 8 session. According to Interfax-Ukraine news agency, Radical Party leader Oleh Lyashko demanded that Verkhovna Rada Chairman Andriy Parubiy publish in the parliament's Holos Ukrainy newspaper the names of every lawmaker who left the week's plenary session early for the breakfast in Washington and were absent from the parliamentary meetings. Lyashko also proposed depriving the absentee lawmakers of part of their official salary, but conceded: "I understand that they don't care about their salary if they pay $100,000 each for breakfasts and photos with U.S. congressmen." Viktor Chumak, another lawmaker who stayed in Kiev, suggested that legislators thought it would be more lucrative to schmooze with U.S. politicians than to perform their elected duties. "The prayer breakfast is a get-together and a platform for making contacts," a shrugging Chumak told ZIK TV during a segment called "the [not]working parliament." "There you can exchange business cards, a few phrases, talk, and take a selfie with Trump in the background." Among the attendees in Washington was the head of President Petro Poroshenko's faction in parliament, Artur Herasimov. Justifying the decision to "send" Herasimov to Washington was Sergei Berezenko, deputy head of the Bloc of Petro Poroshenko (BPP) faction, who told journalists in Kiev on February 8 that it was necessary in order to counter the "huge number of opposition politicians...[who] we think would distort information about what is going on in the country." With Herasimov there, Berezenko argued, Washington could hear "what is really going on in parliament, who is pushing for reforms, who is merely imitating the adoption of reforms, who is engaged in populism." 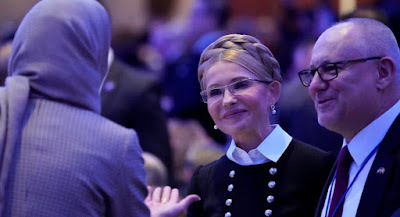 Leading the largest delegation from the opposition was Yulia Tymoshenko, the PR-savvy head of the Batkivshchyna (Fatherland) party and Poroshenko's chief political rival. She was later spotted -- thanks to her trademark braided hair -- sitting in the front row at the prayer breakfast as Trump spoke. Three lawmakers from the Narodniy Front party also went, Interfax-Ukraine reported, citing the faction's head. The news agency quoted the leader of the Opposition Bloc as saying none of its members went to Washington. It wasn't just lawmakers who attended the breakfast, as Ukrainian government officials were also there. Among them was Vasyl Hrytsak, chief of the Ukrainian Security Service (SBU), who was photographed after the event with the podium where Trump spoke in the background. The National Prayer Breakfast is organized annually by the Fellowship Foundation, a nonprofit religious organization which works to bring together political, religious, and business leaders from around the world. This year, roughly 60 representatives from Russia's religious and political elite attended, more than three times last year's number, according to Russian officials. Their presence was notable due to the multiple ongoing U.S. investigations into possible collusion between the Trump campaign and Russia, as well as repercussions from Russian cyberinterference in the 2016 elections. Among the Russians was presidential candidate Ksenia Sobchak, who had a few choice words to say about it to the BBC's Russian service. "Honestly," she said, "it was an absolutely pointless and useless event."